Defend your homeland and do not let the enemy break through! 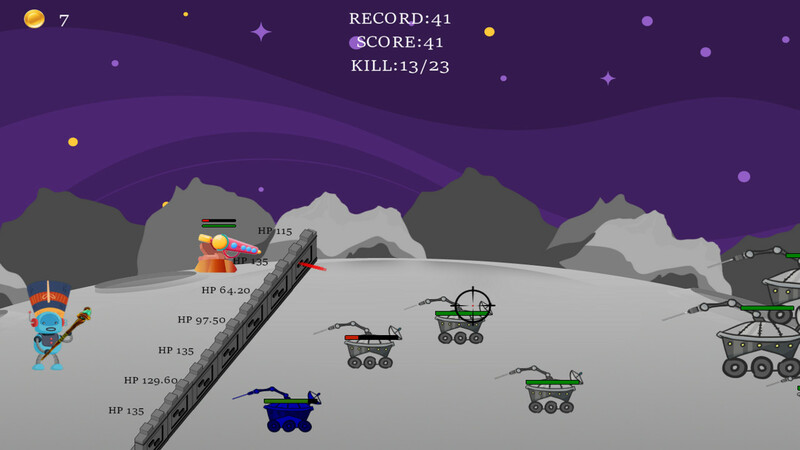 Colonization of the Moon was available as a giveaway on March 25, 2019! Imagine you are an alien living in peace and harmony. 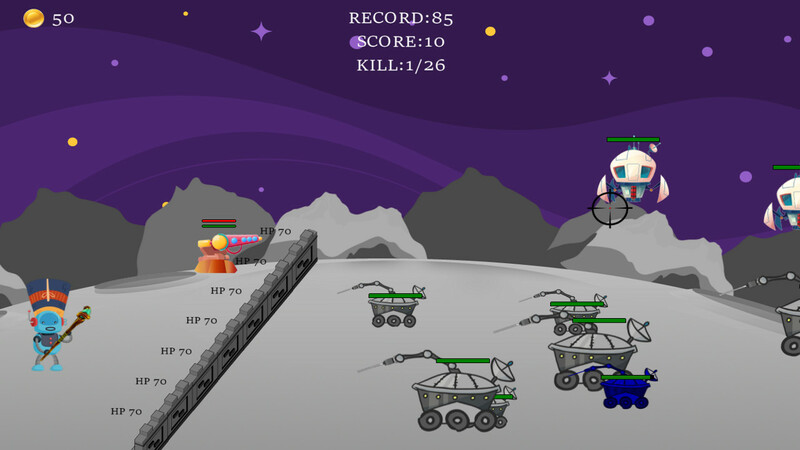 One perfect the moon is suddenly invaded by PEOPLE trying to take over your planet! 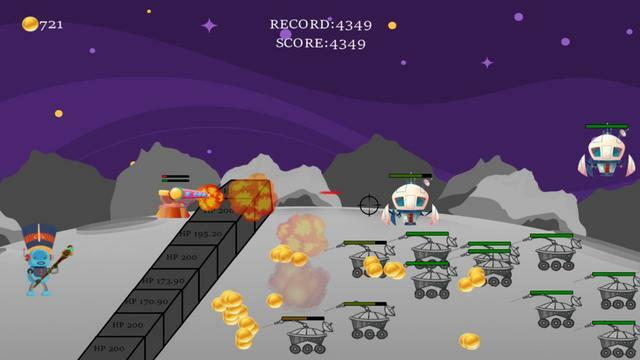 Prove that you can survive all the trials and save the moon! In this arcade you will find a lot of exciting levels that will not leave indifferent even the most demanding fan of the game. The game is a shooter with a side view. Your alien located on the left side of the screen, it has a gun and a fence. 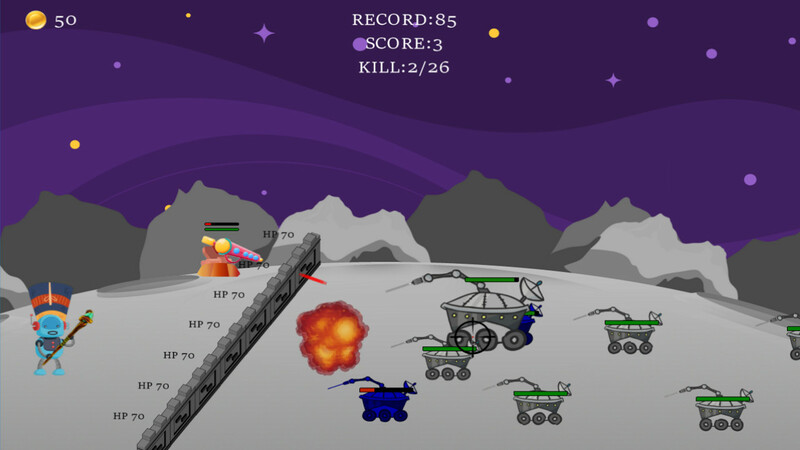 People are attacking from the opposite side, which you need to kill with a gun (left mouse button) and a flamethrower (right mouse button). Defeating enemies with a gun is extremely problematic, especially at higher difficulty levels. Colonization Of The Moon downloads to a 7.4 MB zip file that unzips to two files, (a setup file and a read me). The game installs to the following path by default, but can be changed if you wish. The installed game is approximately 8.14 MB in size. Five shortcuts are installed to the desktop, four of which can be safely deleted . If you want the games shortcut to be installed to the desktop, make sure the appropriate checkbox is checked. Even if this is left unchecked you will still get the four internet shortcuts installed to the desktop; (i.e. 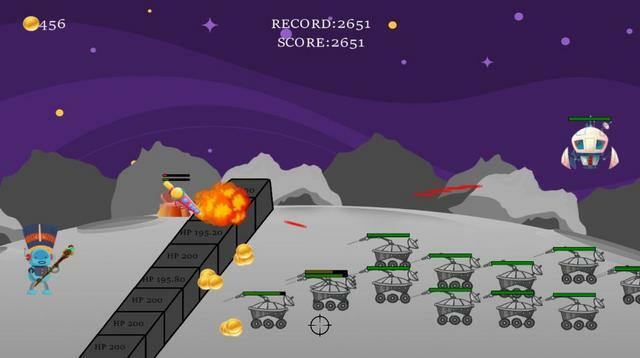 Falco Space - Online Game!, FalconLine Online Games Website, FalcoGo WebGL Games! and Free Games Downloads!). Also, if you don't like icons installed to the quick launch task bar, make sure the appropriate checkbox is unchecked when the 'additional task's window appears (after the Select Start Menu Folder window). The game is a shooter with a side view. You have to defend your home from the invading aliens. 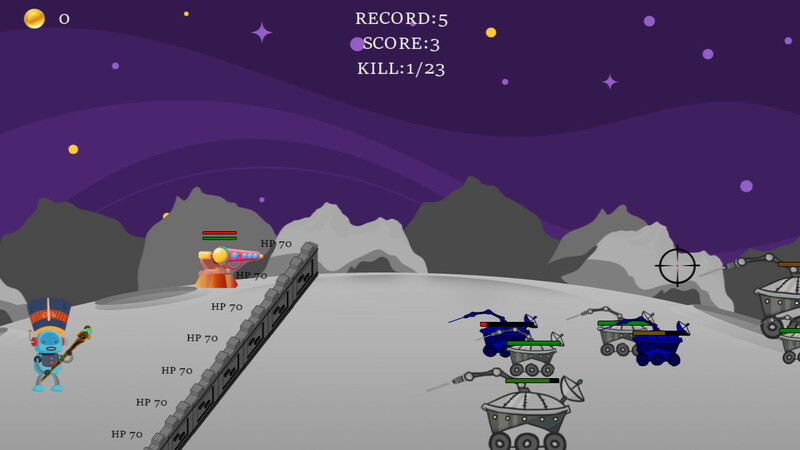 The attacking aliens are located on the right side of the screen. The barrier dividing the defenders (on the left) and attackers includes a gun and a flame thrower. 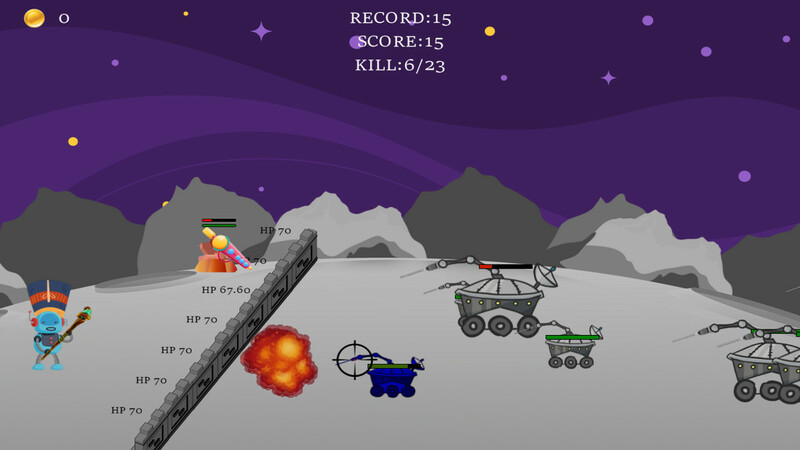 You need to kill the aliens with the gun (left mouse button) and the flamethrower (right mouse button). 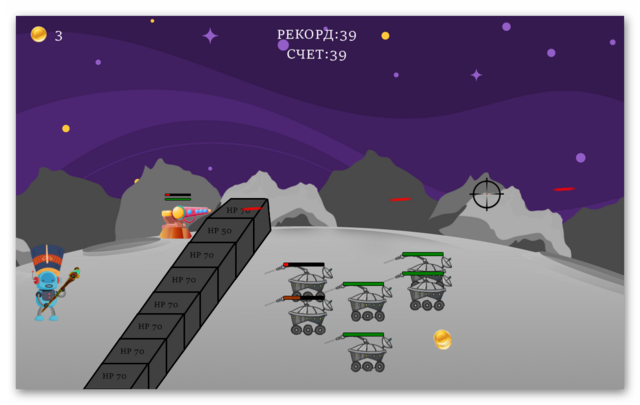 Colonization Of The Moon was made using Game Maker Studio. 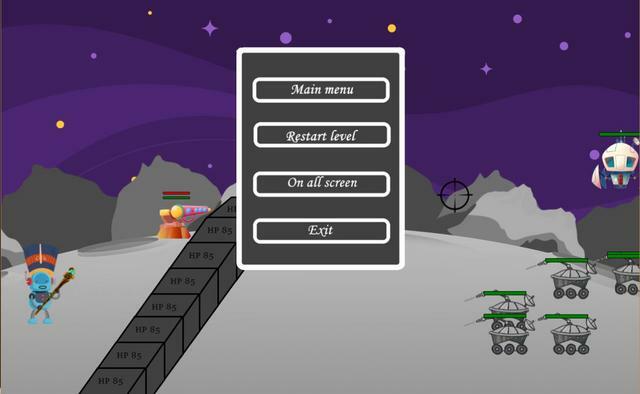 On opening the game you are presented with the options menu, which is in Russian. There is no profile page but you can seemingly select one of two languages via two flag buttons. One for Russian and one for English. Clicking on the UK flag doesn't change anything on the main menu, i.e. the rest of the menus remained in Russian; however, on starting the game you'll find the game is in English if you clicked on the UK flag. The game is simple, shoot the oncoming hoards. If they reach the barrier, they start to reduce its strength. If any of the sections hit points are reduced to zero, you lose and have to start again. There are Five different selections that you can configure, though not all can be increased at the beginning of the game. 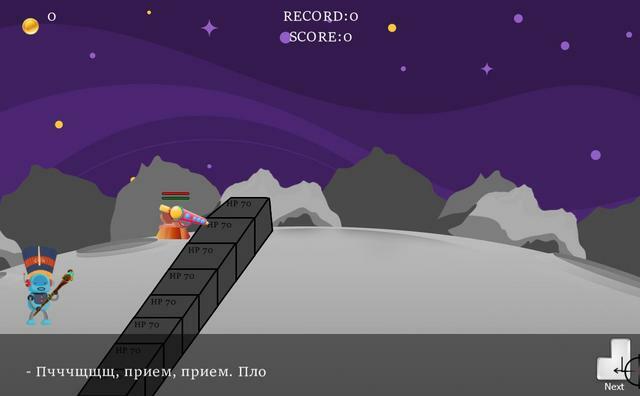 After trying a few combinations, the only thing I could figure out (not being a Russian speaker) was that you can increase the hit points of the barrier segments. Which make it much easier to survive if the alien attackers manage to get to the barrier before being destroyed. I spent over an hour playing this game hoping to find some save points. Initially I couldn't get past level seven until I figured that one of the configuration sliders from the main menu increased the hit points of the barrier. When maxing this out, it became much easier to survive. Once I'd figured out the best way to use the two weapons, it was easy to keep on going with little lost of hit points from the barrier. The gun is best used for long range shooting and the flame thrower for close quarters combat. You can also use both at the same time by holding down both the Left and right mouse buttons. Both weapons are more effective when fully charged. By the time I got to level 45 my hands were hurting so I had to stop. Over several levels I was able to increase all of the items in the main menu (oddly you couldn't increase any of them to maximum until you'd played several levels. As there are no instructions with this game, it's basically a trial and error effort to learn the ins and outs of the game (which are very basic). Once all the sliders were maxed out , the hit points on the barrier were 200 for each segment. 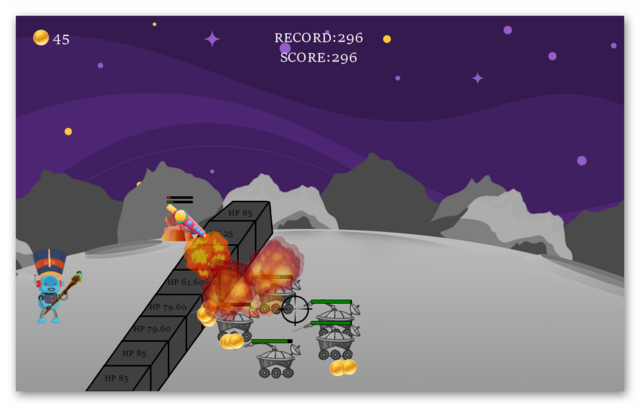 Using a combination of the gun and flame thrower, I was then able to defend the barrier successfully all the time. The only losses I did make were when I took a screen capture. this would minimize the game to the task bar until; I'd saved the screen capture, and I'd find some of the barrier had been damaged as the game appears to continue when minimized. If any of the barrier sections reduced to zero it would be game over. When I tried to reduce various slider controls to see if this increased the difficulty level (for example reducing the barriers hit points) , they seemed stuck once set,. even when rebooting the game. 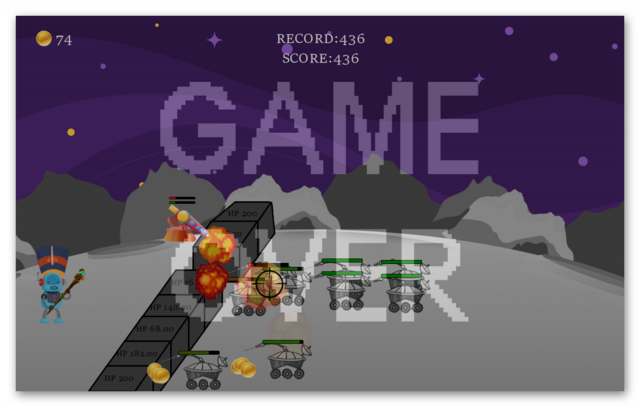 The high score and gold remained when restarting a new game. I really wanted to like this game. It's a sub-genre of tower defense games, which are one of my favorite genres; unfortunately I cannot recommend this game in its present state. If the developer were to add those things I've mentioned above that are lacking, I'd consider buying it via Steam. It's on sale at the moment for only £0.43/$0.54/€0.43/₽ 15). If you were hoping for a moon based game and you have a VR head set, I would recommend you check out Moon Landing VR. There's also an excellent first person adventure game called Moonbase Alpha that's free on Steam HERE. 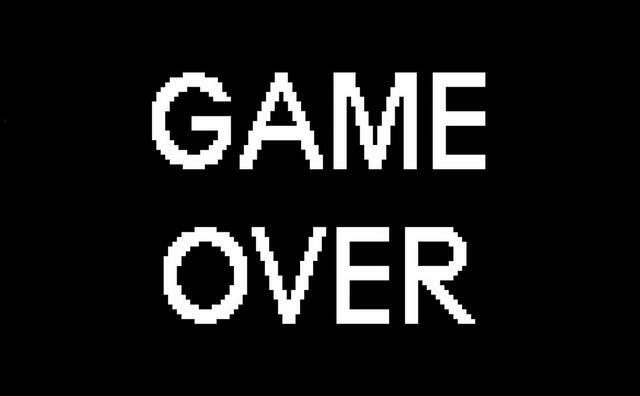 You can see several videos of game play (mainly multiplayer versions with swearing) HERE. You can see an couple of in-game videos of game play via the Steam store page HERE and one I've just uploaded to my You Tube channel HERE. If you miss today's game giveaway you can always get the game via Steam HERE. If you're having problems installing or activating or getting Colonization Of The Moon to work please visit the FAQ's Thread HERE and read through the communities comments because sometimes fixes have already been posted. I'd like to take this opportunity to thank the developer Imperium Games and the distributor Falcoware Games for giving away Colonization Of The Moon and also to the game giveaway team, as always, for securing other ways to get free games. If Colonization of the Moon doesn't interest you, but you still hanker for something new to play, you'll find details of some game deals whether they be sale items, indie bundles or games being given away for free HERE (I've not updated the thread in a while, but most of the links still take you to the latest deals). The rest of the information that used to be posted in the game review can be found in the forums HERE. Finally, check out Delenns threads for details of other free games and offers HERE and elsewhere in the game discussion forums HERE, (usually on the first page of the game discussion forums). The free game over at Epic Games is Oxenfree a supernatural thriller about a group of friends who unwittingly open a ghostly rift, ( worth £14.99/$19.99/€19.99). Oxenfree ends April 4th, where a new game called The Witness will be given away. Indie Gala have just added Memoranda to their free games list, plus another 20 free games in their recently added showcase section that includes adventure, RPG, Simulation, strategy and casual games i.e. Memetown USA, The Great Story of a Mighty Hero, Camp Sunshine, Five Nations, False Birth, GOR - Gorilla Office Rampage, Home is where Chip is, Age of Fear: The Free World, Die Legende von Saya: Befehl aus der Dunkelheit - (The Legend of Saya: Command from the Dark), What Never Was, The Last Humans: Awakening, Childhood, Dunwell, Safe Not Safe, Hi Hotel, Bugs Must Die, Cuadradito y Circulito, Hellino, Hovership Havoc and Wake Up , or you can find them all HERE. Finally, there are some excellent bargains on sale via Steam HERE. Whiterabbit-uk, great review. You covered everything I wanted to know. This seems almost a clone of the game Steam had in one of their sales, except there were different planets to visit, and different places on each planet to defend, and you could win many excellent games if you were very lucky (I wasn't). The Steam sale game was fun because you had to decide what game(s) to try to win, visit the appropriate planets, and play a few rounds on each planet. I can't imaging playing up to level 45 with no way to pause or save. I'm not that curious! I appreciate the time you spent on this, and reading your review kept me from spending even more of my time. Thanks! Does it mean, so no more free steam keys?